So after the Samsung related rumours have gone out for a vacation, it’s time for Apple to take the driving seat and so here’s a latest one related to the long-rumoured 7 inch iPad mini. 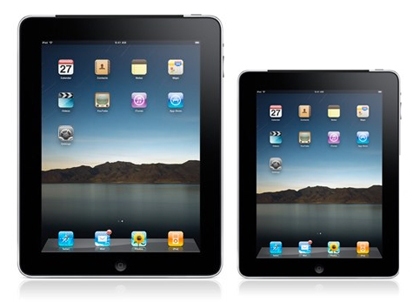 According to the source, the 7 inch iPad is on track and may go on to arrive in October 2012 along with the next iPhone. But the most interesting part of this rumour is that the mini may arrive with a price tag of about $200 – $250, which if happens to be true, would be killer. What Apple might be planning to do is kill competition just like it did when it planned to expand its iPod range of products. There is still no confirmation as to what screen size would Apple go ahead with but we do know and have heard that Apple is having a 7.85 inch mini in its labs for testing. Going by the design we can guess that the 7 inch iPad mini would just be identical to the 9.7 inch iPad, just scaled down and may include the 2048 x 1536 resolution display as in the new iPad. Again the price range is a major question as we do know that bringing an iPad mini with the retina display with a price tag of $200 – $250 would be indeed difficult. This price tag could only be achieved if Apple cuts down on the memory of the device and start with only 8 GB of internal memory. But if Apple does succeed in its endeavour of achieving the final product in this price range, then all its competitors specially Amazon which sells its Kindle Fire for a dirt cheap price will find it tough or almost impossible to survive in the tablet market. But then all of these are just rumours and speculations and we probably will only know about Apple’s plan either as we near the launch or only when the iPad is launched as it usually happens, thanks to Apple’s tight security.